iPhone 6/7/8/X Ringtone not Working on iOS 11/12? Fix Now! Hi iMyFone! Why is my assigned ringtone not working on my iPhone 6 after updating to iOS 12/11, how can I fix it? Please help, your suggestions are greatly appreciated. Thanks! Lots of Apple users have been complaining that their iPhone ringtones not working after they updated to the iOS 12(or iOS 11). For some, it’s either the device isn’t alerting(ringing) at all, while for some, their preset ringtones changed to the default ringtone after updating. Whichever challenge you are faced with, we will be showing you some simple and effective tips to fix these issues. When you notice your device has stopped ringing out, it is important to check to be sure you didn’t put the mute button on. If an orange/red line shows on the switch, this means your device is on Mute mode. 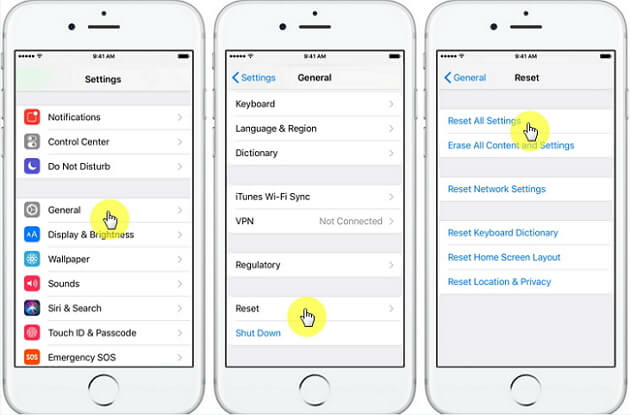 Turn off the Mute switch by pushing the switch towards your screen to switch ON your device ringer. Some minor bugs or issues may occur after updating to the iOS 12/11, one of which could be the ringtone not working on iPhone 6(or iPhone 7/8/X). To turn off device, press down the Sleep/Wake button until the device shows “slide to power off,” and reboot the device after few minutes by pressing down the same key. Your device will restart to its factory settings. This should thereafter solve the ringtone issues. Have you tried the above tips, and you still can’t sort out the ringtone issues on your device? Then we will recommend you do a hard reset on your iPhone. Please note that this process totally erases all data and information on your device and restores it to its factory settings. It is therefore important that you back up your device first, so that you don’t lose important data. 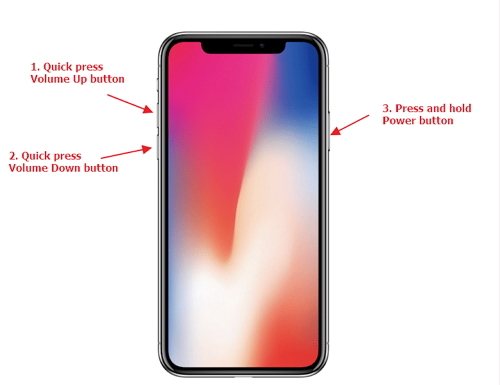 Press Down the Sleep/Wake (power) button until the Apple logo appears on the screen. 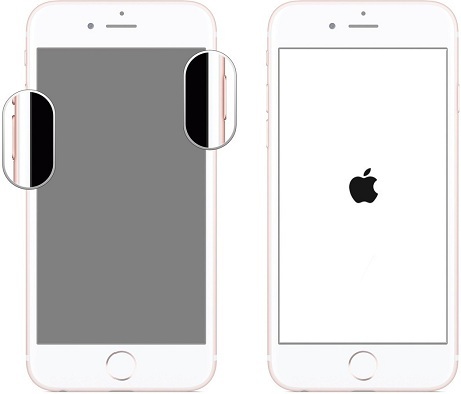 Press and hold down the Sleep/wake and Volume Down buttons together until the Apple logo comes up on the screen. 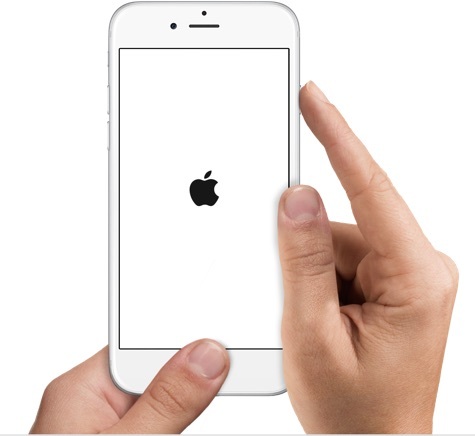 Press down both the Sleep/wake and Home buttons until the Apple logo shows on your iPhone screen. 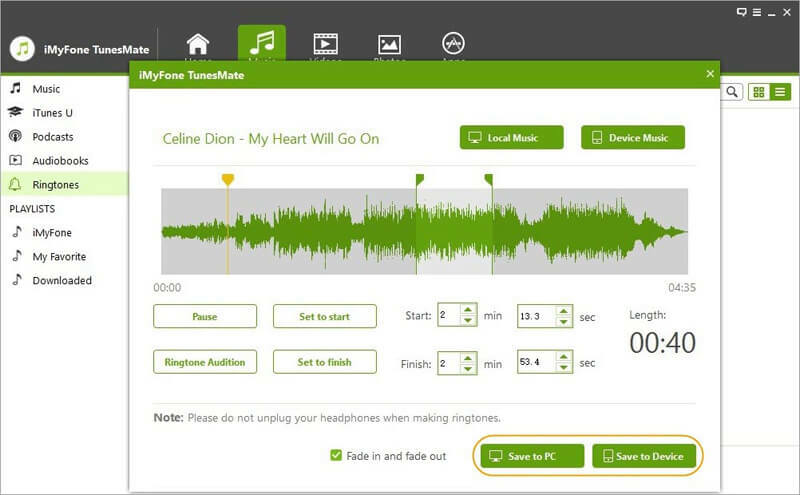 When it comes to customizing ringtones for iPhones, iMyFone TunesMate has proven to be the best option. Superb media management software that gives you room to make any song of your choice a custom ringtone for your iPhone. Flexible and easy to use, all you just need do is to select the song to begin. It allows you to make ringtones using any music files from your PC or iPhone. It allows you to create custom-made ringtones by manually selecting a preferred ‘Start and Stop’ point in the music. It allows you to preview custom tones before transferring to iPhone or saving on computer. You can use the “Fade in and Fade out” feature to modify preset tones. Transfer ringtones to your iPhone without necessarily having to use iTunes. 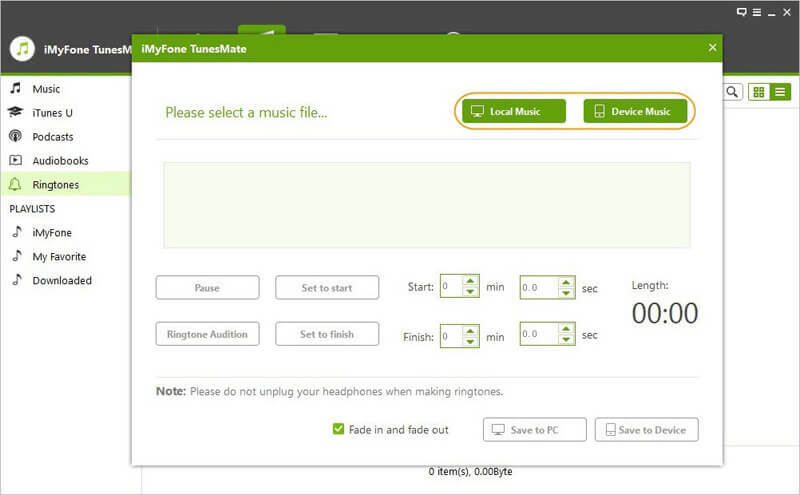 Step 1: Download, install, and launch the iMyFone TunesMate package on your computer if you don’t have it installed already. Thereafter, connect your iPhone using a USB and wait for the software to detect your device. 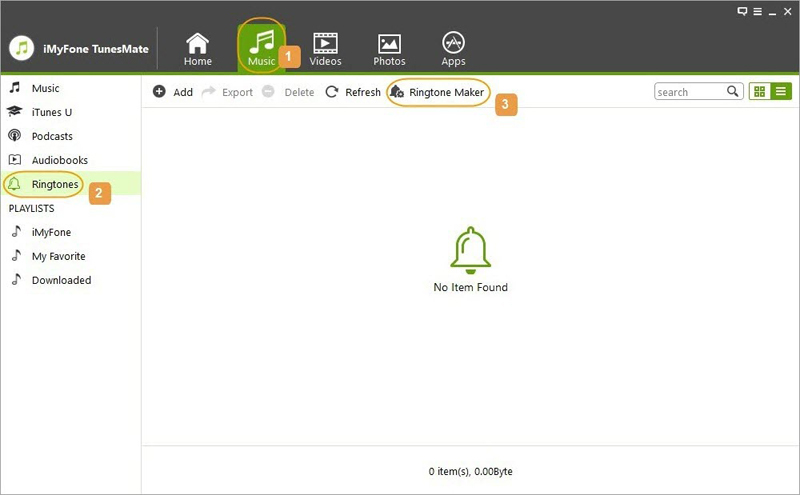 Step 2: Go to the Music tab at the top of the TunesMate interface and select the Ringtones options, then you will find Ringtone Maker option, click on it. Step 4. Set start and finish time, and click on Ringtone Audition to preview it. Step 5. Finally, save your custom ringtone to your iPhone by click on Save to Device button. iMyFone TunesMate is also a unique iPhone data transfer that helps you to transfer media files directly to your iPhone without necessarily having to use iTunes. It is a fast and very easy means of transferring files between your iPhone and your computer, and is highly recommended due to the numerous features and advantages it comes in. Interestingly, TunesMate is well designed to make sure that your personal data is well secured while transferring your media files, i.e. there is no risk of losing your original media files. Transfer files to your iPhone without deleting previously saved data (iTunes will). Two-way transfer method: Transfers media files between your iPhone and iTunes or PC. Supports ALL types of media files, including music, videos, photos, playlists, ringtones, podcasts, audiobooks etc. Full compatibility with the latest iOS 12 and iPhone/iPad.